A new edition of Marxism in the U.S. seems to have come at a propitious historical moment not only for global society but also for phenomena that can still, with many reservations, be called Marxism, Marxist ideas, Marxist-based projects. The particular crises at hand, economic, social, political, and ecological, are so numerous and fast-breaking that headlines are likely to overtake specifics even before words reach print. But crises they are. Hence, the return to a subject that appeared, according to dominant liberal and conservative narratives, to have been dead and gone, following the collapse of the East Bloc and the transformation of China into a global capitalist giant. The "rediscovery of Marx," not only in the United States but in many corners of the world, is bound to be a most intriguing development for new, especially young, readers. Whether this rediscovery is rooted only in the spreading catastrophes, often more acute for the young than the old, or in the perception that hardly any place remains on the planet unconquered by capitalism, may not matter much for our purposes here. Nor do we know very well, at this writing, what the future, near as well as far, will do with the rediscovery. My main effort is to make some rapidly disappearing history available to the reader, but also to point out that large chunks of this extended history keep happening, and that they count. 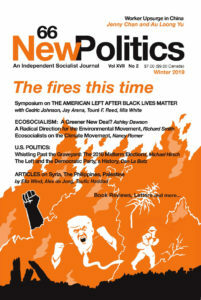 It was my own intent, in the launching of the New Left magazine Radical America in 1967, to foster a Marxism worthy of the challenge of U.S. society, neither dogmatic (we used to say "mechanistic") nor sour, but exuberant, creative and linked directly to social movements and activists themselves. Things never work out simply and sometimes they seem not to work out at all. Still, here we are in an explosive new decade yearning for radical, useful interpretations. All this is so obvious that, at first glance, the absence of a Marxist revival would be more mysterious. The Marxism of today is overwhelmingly a critique of an uncertain, often staggering economic and social system, a central but no longer an altogether self-confident, dominating force within a severely troubled global system. The anti-Hegelians who long ago argued for a Marxism without teleology seemed to have had their point made for them. Except that without teleology, Marxism tends to flatten into a lukewarm social democracy surviving as a political force only by giving up the goal of transcending the system and with it, the social relations of the work that, so far, goes on through one technological development after another, alienated as ever. The premise of Marxism in the U.S., as I began to pore though old newspaper files during the New Left years of the later 1960s — turning, a decade later, to interviewing octogenarian survivors — was the role of Marxist thinkers in relationship with actual mass movements. The political place where I started, struggling to answer or at least reframe questions bearing immediately upon the creation of a campus antiwar movement, led me slightly beyond straight intellectual or political history where theorists have always had difficulty finding their way or at least their audience. A laconic leftwinger of the 1910s quipped that writing books had ruined more socialists than had drink, though each had taken its share. The United States has produced few great Marxist theorists but many effective organizers, popularizers, and strategists of the kind who formulated and developed the unique vision of the Industrial Workers of the World (IWW). Stumbling forward myself from a collapsed New Left, trying to understand the deeper histories of the Left in immigrant communities that continued speaking their native tongue, I discovered a creativity of adaptation, from the earliest days in blue collar neighborhoods to the civil rights era and beyond. In part, I had been conducting a study all along, often unbeknownst to myself, of what we might call cultural sediments that made the Left real within sections of working class life. German blue-collar neighborhoods of the 1860s-70s, as well as workplaces, had been the source of a briefly powerful socialist and anarchist (or rather, "Social Revolutionary") movement, as did the emerging Jewish, Slavic, and other newer immigrant neighborhoods at the end of the century. The Popular Front, thirty or so years later, depended upon these neighborhoods and their children, as well as upon kinds of culture already different from the cultures of the ethnic clubhouse and union headquarter. To the familiar charge that these groups held "foreign" ideas, they were indeed "foreign" to much of mainstream American culture and society, but responding very much to the conditions in front of them. I was keenly aware of time running out on my reaching the remnants of historic leftwing movements. The day of the old time editors and of mostly self-taught Marxist intellectuals was passing, although it had not quite yet passed. I quickly learned that even the works written within private libraries (more often, in public libraries or the back rooms of leftwing newspapers) and cramped apartments had once carried the prospect of reaching thousands of activists in organized branches of parties or at least sympathetic to them. The writers of these works ventured on speaking tours among fellow oldtimers, meeting devotees until the end. By the early 1990s, the memory of this kind of role had faded badly, even while the histories and legends of leftwing thinker-activists in other parts of the world became more thoroughly documented by new generations at home and abroad. To say that these assorted developments have offered me conceptual as well as research problems for the current edition of Marxism in the United States would be a considerable understatement. Still, there are many items of new as well as renewed interest. When a twenty-something activist — returning to graduate school when a phase of well-paid, unionized blue collar worker ended with the job — emailed me somewhat sheepishly that only attractive leftwing websites held his attention, he captured a bit of the persistent reality. Behind the paucity of grand theory written on these shores has been a rank-and-file reality. Tomes and theoretical journals, from the early years of the century onward to the 1960s, mostly went unread even by party members loyal enough or ambitious enough to buy them. True to the leftwing past, activists of Students for a Democratic Society, including those avowing their Marxism within the doctrinaire circles of assorted Leninist factions, were rarely deep readers, nor were the successor cadre-style activists of the 1970s, before that movement faded. Socialist conferences such as the annual events in New York and Chicago up to the present time offer bite-sized theory to good effect, but may possibly measure the depth of understanding for most listeners. An impressive raft of books has indeed appeared since the New Left, created by veterans of the 1960s movements; their connection with ongoing social struggles remains a problem for discussion. Then again, there is the question of how even the most influential efforts of the American Left have been understood by the outside world. Radical journalist John Nichols performed a remarkable turnabout of the current right wing slogans with The ‘S’ Word: a short history of an American Tradition…Socialism (2011). Nichols did not wish to claim that Marxist or socialist doctrines had ever taken much hold in national policies in their own name, but rather that at least from Marx’s little-understood (until recent work, that is) correspondence with Lincoln, and arguably earlier, reform notions owed much to the socialist tradition. It would be difficult, indeed, to parse the egalitarian triumphs, separating out the imperial projects abroad that accompanied them, from Andrew Jackson’s war on Indians (simultaneously on the Bank of the United States) to Harry Truman’s GI Bill and onward through the last great burst of reform, during Lyndon Johnson’s tenure, not to mention gay marriage and drones, policies twinned under Barack Obama. Nichols’ point was made for him (and all of us) when the use of "Socialism" as a hate word prompted large numbers of Americans, asked in recent opinion polls, to say that they would probably like socialism better than capitalism! Not likely, however, the socialism of any older version. The giant change from the Marxist past is, obviously, that a now largely absent, bemuscled industrial proletariat long considered destined to seize the factories, is obviously not going to Make The Revolution. At least, not in the United States. Technological workers in every sector, likewise health workers, certainly can shut down the system, but this is something different. The backup to the often defeated and disappointing domestic class struggle has forever been the struggle far away. Major candidates in the fall political season have dropped "working people," let alone "working class," entirely, for "middle class"; more amazingly, so have union functionaries urging their favorite candidates upon the public. Today, the renewed presence of a global conflict along class (as well as other) lines, is often marked by tactical innovation, but also by the current absence of some vast and connected, international movement for socialism along with a credible "socialist homeland," notwithstanding Cuba, Venezuela, etc. Snapshot of a moment: At the Left Forum in New York, April, 2012, the crowd is more young than old (a distinct change from a decade earlier), the Slovenian philosopher Slajov Zizek has something like the cult-prestige accorded to Jean Paul Sartre a half-century earlier (with perhaps a similar degree of verbal mystery), and while "Marx" and "Marxism" are not heard in every panel and workshop, their presence is undeniable. Indeed, the workshops outflank the panels (with its famous members) by sheer numbers of participants, overall. People wish to learn what to do, how to do it, quite as much as they are looking for deep, theoretical meanings. What could Marxism look like, in only a few years, amid occupations, the global struggle for an end to wars and toward a radical democratization and ecologically sustainable economy? That is a query worth posing, if answers remain beyond what we can securely grasp today. Some avenues were not followed in the first and second editions of Marxism in the U.S.. Much useful scholarly effort since 1990 has been devoted, as the careful reader will note, to the extension of Marxist ideas into various areas as history, literature, ecology, economics and so on, as more books (and journals) on these subjects have included Marxists and related leftwingers as subjects. To take a case in from my own subsequent work: I could not, before extended research and interviewing on the subject of the Hollywood Blacklistees, have appreciated the Hollywood Quarterly in its reddish-pinkish-golden years (1945-49). The dive into film history at large, and television history that followed was by no means mine alone. But the idea that screenwriting and other work on films — marking a real struggle over the content of the single most significant cultural or artistic media of the day — actually had a significant Marxist history in the United States with leftwing writers, directors, actors, and technicians of all kinds in dialogue, was a revelation. Now that I look back from a further distance upon the 1960s-70s, I see better what I had only begun to glimpse: the power of the trailing penumbra from the Popular Front milieu, as a key trend within popular culture and its study, even as the counter-culture seemed to pose a wholly different kind of challenge to the reigning system. The Popular Front’s severe cultural critics, when not vulgar red-baiters, have mostly been, historically, aesthetes who view themselves as radical avant-gardes, treating film as a species of literature and convinced of the corrupting power of popular culture. They naturally would not see film-making from the inside, as a set of socialized work relations with the struggles of a variegated, partially radicalized workforce. The later development of auteur criticism pointed up the artistry of film but often removed the context and history, with similarly stifling results. More recent studies in folk music and jazz, modern dance, and theater have produced a similar scholarship of nuance, highlighting the accomplishments (emphatically including interracial milieux and movements) along with the obvious limitations of the Popular Front impulse. There are other areas in which the two earlier editions of Marxism in the U.S. also came up significantly short. The exploration but also the popularization of the criticism of Soviet Communism’s degeneration and the resulting effects upon the global Left fell, at least in a Marxist sense, mainly if by no means only to the Trotskyist movement and its leading intellectuals during the 1930s-40s. Socialist and liberal anticommunists for their part largely abandoned Marxist critique wholly and often explicitly. Defense of liberal capitalism and the U.S. role in the world had become their destiny and for a large number, their occupation as well. During those two crucial decades, making Trotsky’s own texts available and glossing them could be described as the real contribution of such an indefatigable intellectual and agitator as Max Shachtman, translator and popularist, group leader, stirring orator and inveterate factional in-fighter. In several important ways, Shachtman followed a favorite of mine, Louis C. Fraina, first U.S. publicist of the Russian Revolution by way of a documentary classic, in 1918. Trapped within the factional brawl of the day, Fraina never reached readers the way John Reed’s Ten Days That Shook the World, and as noted below, his pioneering work sank quickly into obscurity. Shachtman for his part wrote, translated, and edited even further against the grain: most leftwingers did not want to hear what he had to say or judged it to be self-serving (a criticism at times painfully accurate) by those whose wild imaginations projected their small factions to replace the Communist Party and lead the proletariat to victory. Meanwhile, the intense followers of Trotsky notoriously fell out among themselves on a regular basis. The tragedy of Max Shachtman was more than personal, and concerned more than Trotsky or Trotskyism alone: by the time his own creative intellectual work had consolidated, he had slipped so far rightward that "Communism" had become a great bogeyman to be fought with the help of any allies available. He had turned, in his last years, into a supporter for George Meany, the most conservative leader in American labor history. Some of his last disciples became leading neoconservatives, while others led socialist groups that still survive and are robustly leftwing. Shachtman and his ilk obviously outlived their own time, a thought that weighed heavily upon me, a middle aged radical penning Taking Care of Business, a study of U.S. labor-bureaucratic history with a continuing backstory as strange as that of the deeply conservative Sam Gompers’ youthful Marxism. Within this general milieu but hanging onto socialistic ideals, Michael Harrington, whose oratory prompted me to join Democratic Socialists of America in 1984 (seeking to build a branch in Providence, Rhode Island for some years following), was described briefly, but his larger influence partially neglected. Harrington gave his best efforts to the global movement of a temporarily revived Socialist International, joining hands with Scandinavians and others in a vision of egalitarian, global social democracy. His work supporting Jamaican socialists alone would have been a worthy accomplishment, no matter that Michael Manley’s best efforts were thrown off and out by the power of the U.S. State Department and its pawn, the Jamaican Labor Party. This moment is remarkable mainly because European social democracy happened to be in its last phase before going down and out as a threat or even a moral challenge to capitalism. A moment frozen in time, barely remembered but worthy of recollection, this prospect of a different hemispheric Left, a different view of life, remains alive in the music of Jimmy Cliff and Bob Marley. Harrington’s books, with the exception of The Other America, had a short life. Yet he was the last American socialist of the century to have the degree of respectability to be treated sympathetically in the pages of the New York Times. Radical figures like Noam Chomsky and Howard Zinn, not to mention Edward Said, outside but not too far outside the realm of Marxist criticism, remained beyond the pale, perennially convicted of disloyalty. On another site of the small leftwing intellectual world, I mistakenly neglected one Jack O’Dell, African-American Marxist and appropriate symbol of the late Popular Front. Nikhil Pal Singh’s 2010 collection of O’Dell’s essays brings back a crucial figure connecting the Left with the civil rights movement and its successors, all the way to the Jesse Jackson presidential campaign of 1988. A leading Black Communist during the 1950s, when the CPUSA was effectively underground, briefly a key strategist and aide to Martin Luther King, Jr. (until pressured out by the FBI’s squeeze on King), O’Dell went on to work and write unsigned editorials for Freedomways (1963-87) during most of the years of the journal’s existence. O’Dell’s keen analyses, Marxist in quality without any doctrinal claims, pointed to the building of coalitions, seizing historical opportunities, and working simultaneously inside and outside the Democratic Party, inside and outside Pan-African movements. This edition of Marxism in the U.S. was, it may be noted, prepared against the background of the Wisconsin Uprising, a massive movement February-April, 2011, and the long months beyond. For perhaps ten weeks, near-daily demonstrations occasionally growing to more than a hundred thousand featured large American flags side by side with "General Strike!" banners and hilarious satirical posters, pre-union chants, tractors, and other times motorcycles circling the capitol in protest, and of course the weeks’ long occupation of the capitol building itself. The crowd fused a "union" message with defense of the social state. "Marxism" was invisible, but what to make of the surge of class-consciousness posed within social-consciousness, on a scale not seen in generations? What avowed Marxists in groups did make of it was, in large part, overly familiar. Leftwing groups based in New York, Chicago and Detroit, came to explain to Wisconsinites what should happen now, and how they were letting down the cause by giving in to popular sentiment supporting the fourteen Democratic state senators who fled to Illinois, or giving in to the labor federation that discussed a General Strike in its press, but lacked the means or will to carry it out. Behind these deeply sincere complaints aimed at a kind of vindication after decades of disappointments, lay the difficulty of outsiders seeking to grasp the unique traditions of the state (beginning with the traditions of Robert M. La Follette, who had established the Recall provisions now deployed) but also the changed nature of the workforce, by this time state government employees, disproportionately women in teaching and healthcare. The horny-handed proletarians on hand, adding an old time flavor to the struggle, were very often union retirees of industries now gone forever. The labor chorus that sprang up and became a key force continuing the public spirit, in and around the Wisconsin State House, of the struggle across the long months from August, 2011 to the June, 2012 election (and defeat) recalled something like a Pete Seeger or La Follette view of American democracy, with civil rights and feminist updates. Leftwing Wisconsin joined a population more determined than ever to fight for the real gains made in social welfare, education, and the environment. "Solidarity" was sounded in a new key, the enemy attacked and ridiculed with new means and a new sense of humor. The nation-wide "Occupy" movement, inspired in part by and following the events in Wisconsin (as ours was inspired by Tahrir Square and the Arab Spring), seemed to create a new and yet different constituency for change, and for an extended moment, actually shifted the national debate from Democrat versus Republican to the one percent versus the ninety-nine percent. Under police attack and unable to go further, Occupy evidently faded as well. But the face of the struggle against austerity, across wide parts of the world, had been clear, with every age, every race, and gender represented. How Marxist? The future would tell. Perhaps readers will not mind if I add a word more to the story of the personal pre-origins of this study, before my engagement with the local civil rights movement and that living museum known as the Socialist Labor Party. After age sixty, as is well known, childhood memories tend to grow closer. The first hardback book (not comic book) bought for me, at my own request, happened to be a pictorial history of the Civil War, almost certainly because my mother’s great grandfather was an Abolitionist farmer who marched with Sherman through Georgia, a strategic campaign dooming the Southern cause and slave system. In her childhood, he lived for a time with the family and with his nephew, an erstwhile drummer boy for the Union troops, reminisced by the hour. Similarly, my only and favorite musical "album" (literally, four 78s) was a Johnny Appleseed musical drama, all parts sung by radio personality and Irish tenor Dennis Day, treasured in part because a great aunt of mine claimed to have on her farm an apple tree "planted by Johnny" (in rural Illinois, this farm might actually have received apple seeds from John Chapman, in Ohio or Indiana, although admittedly many such claims have existed). I wanted a past different from the one presented in movies, magazine and radio. Perhaps I was already destined to publish, one day, a journal titled Radical America —although I suspect that an African-American, eighth-grade teacher of mine named Wilborne Bowles also planted the specific love of U.S. history into my head. One more point in memory, this one largely borrowed. After I joined the small congregation of social historians seeking to tackle the working class and radical story in more than one culture and if possible, more than one language, I had another experience or two plunging me in the direction of this book. By marriage, I had come into contact with, and in a removed sense joined, a mostly Slavic, blue-collar community at the northern tip of Illinois, near the Wisconsin border. Here, most amazingly, the remnants of "Cooperative City," as Waukegan, a home of Little Steel, had been known by since the 1910s by its activists, still existed in recent memory. By the end of the Second World War, nearly half its residents were in one kind of coop or another, milk to banking. The Slovene Hall, less than a block from the Slovene Church but with little overlap of membership, contained a library with portraits of Marx and Ivan Molek. Interviewing oldtimers while visiting in-laws in 1981, I found the aging leader, who entrusted me with the printed history of this socialistic institution (he had been waiting, he told me, for someone to ask). My wife, in her childhood, had performed her piano recitals there. Like the nearby Croatian Hall whose leaders had leaned more toward communism than Slovene-style social democracy, but shared the Slovene enthusiasm for Tito, they were part of a left-leaning blue collar scene that slipped out of existence within decades after the war. As of 2012, the very setting is abandoned, surrounded by neighborhoods of houses with doors boarded. It did not last very long, this world, but it had been a real world of labor activities and secular radical education for several generations. With as good a claim on "American Marxism" as any other, it has remained, for me, an imperishable memory. As with the erstwhile immigrant Jews, Hungarians, Italians, Poles and other immigrants, the equally aged African-Americans, hayseed rural radicals and others who were kind enough to spend time with me, they were my windows into the lost age. Their lifetime dedications (in Yiddish a "shayner, besere velt," a more beautiful and better world) have become mine. This essay is adapted from the Preface to the 2013 (third) edition of Paul Buhle’s Marxism in the U.S. (Verso). PAUL BUHLE is a sponsor and a regular contributor to NP. He would like to thank several close readers, but especially Bill Fletcher, Jr., and Steve Early, for their comments.